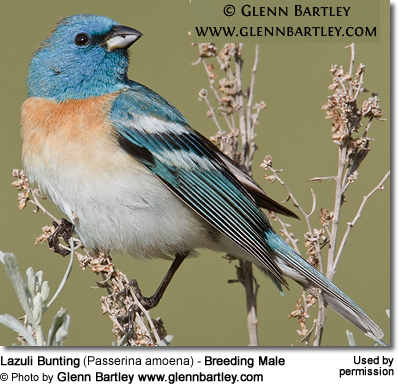 The Lazuli Buntings (Passerina amoena) - also known as Blue Linnets or Lazuli Painted Finches - are colorful North American songbirds that resemble the Western Bluebird - both in size and plumage details. These buntings are naturally found in many areas of western United States, and migrate south to winter in Mexico. 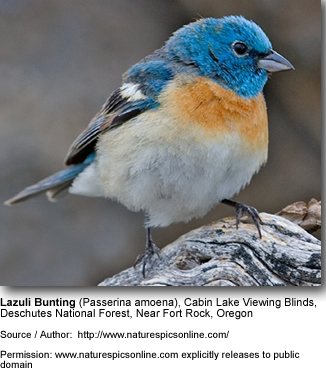 The range of the Lazuli Buntings extends from southern parts of British Columbia west to Saskatchewan in Canada, south through the western and central areas of the United States into Mexico. They breed in southern Canada, western United States south to southern California and extreme northwestern Baja California; and from Montana and North Dakota south to western Oklahoma and northern Texas, and from there their breeding range extends into northern Mexico. They migrate to spend the winter in southeastern Arizona and Mexico. Within their range, they are common and widespread. Its population is considered stable. 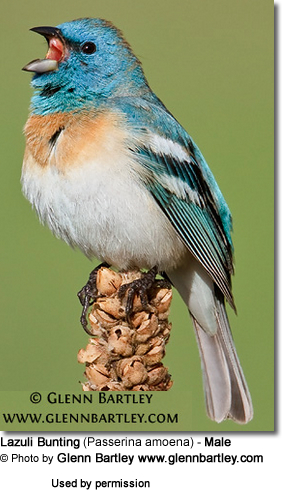 The Lazuli Bunting is a small songbird that measures about 5.1 - 5.9 inches or 13 - 15 cm in length (including the tail); and weighs between 0.5–0.6 oz or 13–18 g.
Breeding (Alternate) Plumage: Head and back deep blue. Upper chest reddish. Lower chest, abdomen and under tail feathers are whitish. The lores (area between the beak and the eyes) are dark. They have two distinctive wing bars. Winter (non-breeding) Plumage: Plumage is overall dull-brown. On the face and back, the blue feathers are tipped with buff. Paler and duller brown plumage, greyer on the back and buffer below. Resemble adults, but juvenile males have paler and duller blue plumage with feathers that are brown or buff tipped, particularly on the head, back of the neck (nape) and the back giving them a dull blue-brown, blotchy appearance. The bill is short and thick. The upper bill is dark grey and the lower pale grey. The legs and feet are pale grey. Resemble the Eastern and Western Bluebirds, except the Buntings are smaller in size and can generally be identified by their wingbars (male or female). Their diet consists of seeds, fruits and insects. They often hop on the ground foraging for seeds, but are also known to frequent bird feeders. Insects are gleaned off foliage of trees and shrub, or they may capture them in flight. 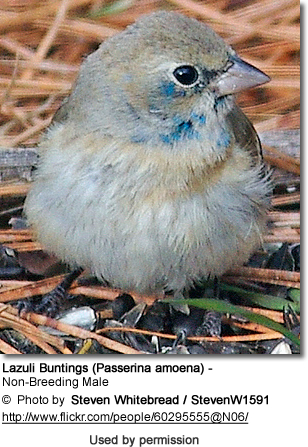 Lazuli Buntings nest in loose, open cups constructed using coarse grasses, rootlets, strips of bark, and leaves. These nests are lined with fine grass, rootlets and animal hairs; and wrapped in silk. 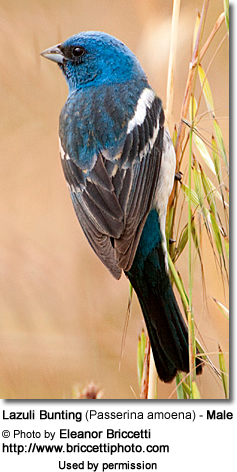 Their nests are usually placed in concealed areas in bushes or shrub, typically close to ground. A clutch consists of 1 - 6 (mostly 3 - 4) pale greenish-blue eggs.